Whether you’re celebrating your wedding or hosting the perfect party, our flavour-packed, one-bite wonders are sure to get mouths watering. Here at Tea Set Towers we create a range of indulgent canapés for you and your special guests to delight in. Where possible, we use local suppliers and ingredients making our food fresh and tasty. Our offerings come in the form of two menus; one featuring smaller bites such as crostini with tuna and caper pate, and the other more substantial, including one of our favourites - mini Yorkshire puddings with roast beef and horseradish cream! If you’d prefer to create your own mini menu or substitute one thing for another, we’ll do our best to cater to your individual requests and requirements too. Our delicious canapé menus are available to parties as small as ten or more, with a minimum requirement of three items per person. 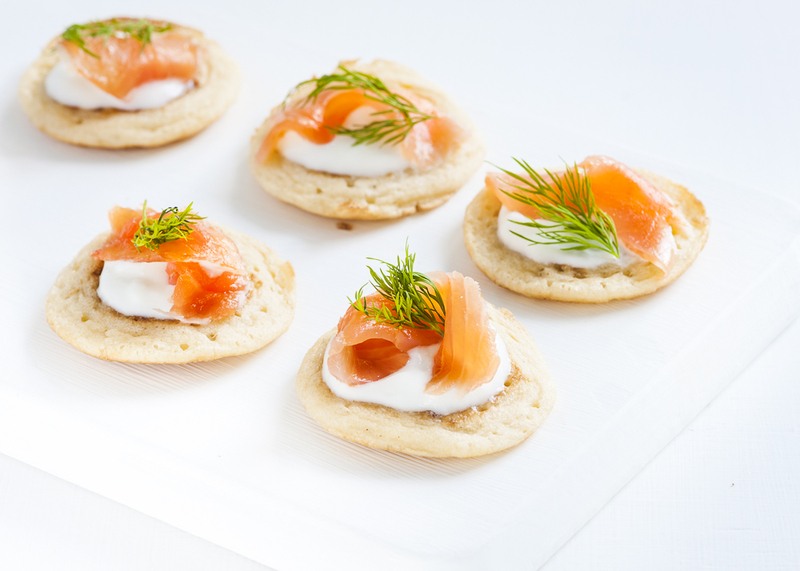 We’ll deliver your bite-sized delights to you prior to your event and can even be on hand to serve the canapés if required. In fact, all you’ll have to do is sit back and enjoy hosting your event while we take care of all your catering needs. What’s more, if you decide you’d like to add that extra special touch and hire our china too, we’ll do the delivery and collection for you. Travel costs are set at 45p per mile. If you choose both our canapé and tea party packages, you’ll be able to satisfy guests’ tastebuds from the moment they arrive right through to the time they leave. So whether you want to add a touch of class to your birthday party or corporate event, or you’d like to keep your wedding guests sweet with treat-worthy finger food, our canapé packages have it all.